In my third Ayahuasca ceremony of my recent trip to SpiritQuest in June of 2016 I experienced a major turning point. The beginning of the intoxication once again started off in a dark place and was very challenging, as it should have been as the issue being addressed was my knee jerk reaction which at first always looks towards the negative. I came to the realization the mind is a hindrance in trying to move past this unpleasantness and the failure to bypass the mental will lead to delusion and travel further down into an abyss of negativity. I turned off my mind and called out the thoughts which tried to repopulate the void. 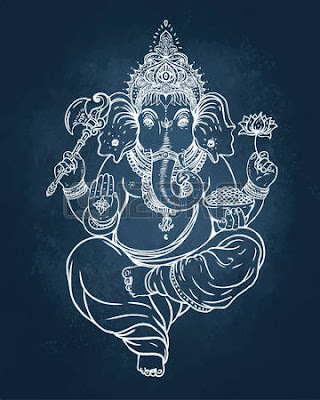 I successfully navigated the treacherous waters designed to shipwreck the Ayahuasca voyager and before me in my vision was the elephant deity of Hinduism called Ganesha. I later learned that Ganesha clears your path of obstacles - the mind, and its ego baggage being a major obstacle of mine. I now have a jacket emblazoned with an image of Ganesha that I constantly wear. This story is leading to this point in time about five months after that ceremony. I walk my dog in the woods on this makeshift path, a path largely of my own creation. There are lots of branches and logs that litter the path, a great deal from an ice storm last March. So a few weeks ago a bunch of workers showed up with chainsaws and wheelbarrows and cleared the path of all obstacles. I ran into one of the workers and asked what they were up to? He said they were cleaning up the river so the water would flow more freely - it's a floodplain where I walk the dog. The path they cleared for easier access of their wheelbarrows and they have done a ton of work; it is quite impressive how much they have cleared. It dawned on me on the weekend I should take this as a physical sign for what I have accomplished post ceremony in my mental state where I trust the heart and let her lead now. It was really quite wonderful to realize this synchronicity. I thanked Ganesha and my Heart/My Mother down at the river's edge. The paths available to me now are a good representation of how the Ayahuasca intoxication initializes. There are now two choices for entering into the woods due to the good work of the clean up crew. The original way was not cleared and you have to navigate over some fallen branches to get to the cleared path. This path is representing entering into the visionary state still being mindful and facing a challenge to trust your instincts and turn off your mind. Once you find the path then it is clear, if you don’t then you get stuck in a maze of shrubbery, fallen trees, rotting logs, and thorn bushes. The other path detours down a trail next to the pond, the pond representing the stillness of the mind. This part is a little tricky but once negotiated the path is opened up in front of you. 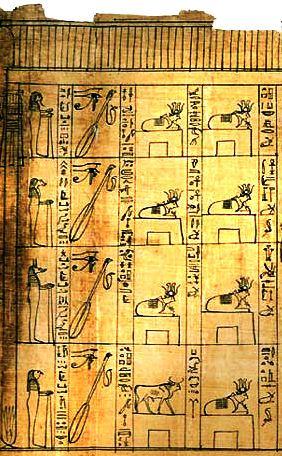 It represents entering into the heart space upon commencement of the intoxication. It is the wiser of the choices but both paths are valid. The clear path last for a good while and then eventually you reach a point where it is not cleared once again. This is a sign denoting that ahead in the journey are challenges but it is familiar terrain now and I'm more than capable of being successful. After weaving through this section I come upon a clearing down by the river's edge that I call witch's cove after these two young ladies who held a full moon ceremony there in May of 2015. I connect here with the Goddess, often bringing incense and smoking mapacho in this location. After this section the trail becomes adventurous and the options for exploring are presented. It is a very apt depiction of what is possible with Ayahuasca once the entrance into its world is cleared and you realize you must check your mind at the door. Thank you very much Ganesha.